Love the look and made well. Needs to be sized but better off big than small. 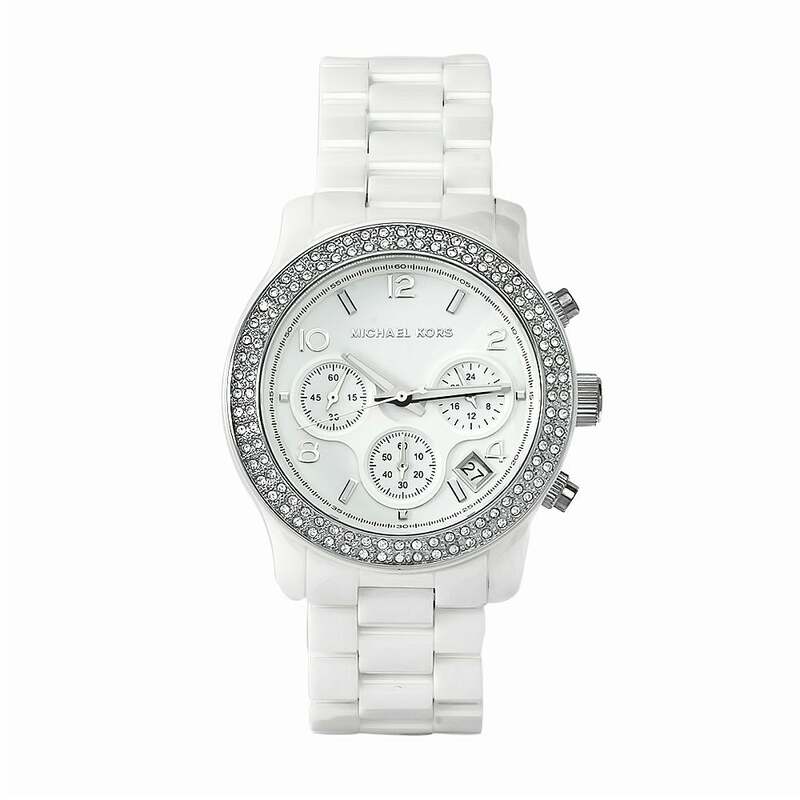 A crystal-encrusted bezel tops the stainless steel case of this fine watch from Michael Kors. A white dial, three chronograph subdials and a white ceramic bracelet complete the unique look of this stylish timepiece. I received the Michael Kor's MK5198 Ceramic Watch several years ago as a B-Day gift from Nordstrom... I loved it so much I decided to review it on here. It's absolutely beautiful and high quality. I wore it nearly every day for 3+ years, including 2 of them while I in nursing school (considering that it withstood this period in my life says a lot about its durability and quality) until one day the band sadly broke. At one point, I attempted to get it fixed at Macy's but the dude at the counter claimed he couldn't do anything with it. 😢 I've been searching for it ever since and this is the 1st time I found it! Here's why it's my favorite watch of all-time: I love it for its looks AND function. Since it's large, the display is easy to read. The chronograph feature is awesome because it provides reliable access to a calendar, stopwatch/timer, and military time (very important if you're in the healthcare field and also helped me during my exam questions that involved military time). Furthermore, the ceramic band is a great option for individuals with highly sensitive skin such as myself (your skin will still have contact with the steel underneath the dial and clasp but this never bothered me). The white band and clear crystals gave it a vibe that was easy to coordinate with various outfits for a polished look. I received soooo many compliments on this watch, more than any article of clothing or accessory that I've ever owned, including several from people that are serious collectors of "timepieces." Towards the end of its life, certain parts of the band started to get a little grungy looking (as it's difficult to clean in between the crevices) as the dial case had some minor scratches, but it was very minimal considering how long and often I wore it... And the the fact that it was white! I do wish it was available for a lower price. The current price is actually higher than what it originally cost ($250). I am so glad that I was able to locate this watch. My home was burglarized and all of my Michael Kors watches were taken (14). I love this watch! great watch - looks and wears well. The crystal face cover fell out when my wife removed the watch from the box at Christmas. Hopefully this was just a onetime manufacturing problem, but this is a fairly expensive watch and this should never have happened. Love His watches and this makes for a perfect Summer Accessory!